The 1931 baseball season was nearly two weeks old and the eight clubs in the American League were still clustered together in the league standings. Cleveland jumped out first as April drew to a close, leading the New York Yankees and the Washington Senators by 1½ games. Boston was holding down last place, but the Red Sox were a scant 4½ games back and there was plenty of baseball to be played. But fans were not necessarily fooled by the early results. Philadelphia and New York had finished in either of the top two spots in the league in three of the last four years. Both teams looked strong again, and the Bombers and Mackmen would again occupy the top two places. Cleveland last won a pennant in 1920 and St. Louis finished one game behind champion New York in 1922. But of late, the Indians and Browns were mired in the middle of the pack of the AL. Although both teams were fairly competitive at times, they could not compete with the powerful squads that took to the diamond for both the Athletics and Yankees. The Tribe had good hitters. 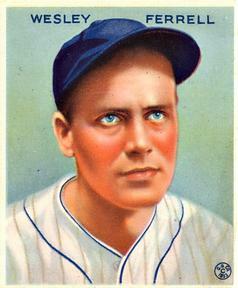 Johnny Burnett saw his first extended play as a middle infielder in 1931. He led off and batted an even .300. Lew Fonseca, who led the league in 1929 with a .369 batting average, batted second. The lineup continued with Earl Averill, Johnny Hodapp, Joe Vosmik, and Bibb Falk. They may not have been cut from the same cloth as the Murderer’s Row lineup, but they could hit. If the Tribe had an Achilles’ heel, it was the mound corps. Wes Ferrell was a 20-game winner in 1929 (21-10, 3.60 ERA) and again in 1930 (25-13, 3.31 ERA). Considering that he was only 22 years old in 1931, Ferrell was well on way to having a tremendous career. The one knock against him was his lack of control. In some seasons, his walks would outnumber his strikeouts. But Ferrell was no easy out at the plate. He was a fine hitter who could occasionally hit the long ball. In 1930 Ferrell batted .297 (35-for-118) and he drove in 14 runs. Willis Hudlin, Clint Brown, and Mel Harder rounded out the pitching staff for Cleveland. All three hurlers spent many seasons in Cleveland, with varying degrees of success. On April 29, 1931, Ferrell (3-1, 3.27 ERA) took the mound against his older brother and his mates at League Park in Cleveland. St. Louis manager Bill Killefer tapped right-hander Sam Gray (1-2, 3.86 ERA) to start for the Browns. The weather forecast called for temperatures to be around 55 degrees and no threat of precipitation.1 A seasonal spring day in Cleveland awaited the estimated 7,000 fans. Jim Levey led off for the Browns and got on base via an error by Cleveland shortstop Bill Hunnefield. After Jack Burns popped out to Hodapp at second base, Goslin lined out to third baseman Burnett, who threw to first and doubled up Levey. Hunnefield atoned for his miscue in the bottom of the second when, with two out, he doubled to right field. He scored on a single to left field by Luke Sewell. Meanwhile, Ferrell retired the Browns in order in the top of the third inning, making it seven hitters in a row he set down. Cleveland extended its lead in the bottom of the third frame. Burnett got it started with a single. He advanced to third courtesy of a bunt by Fonseca and a groundout by Averill, then scored the Indians’ second run on an infield single by Hodapp. Levey led off the fourth inning and got on board again when he walked. But Ferrell set down the next three St. Louis batters to keep the Browns hitless. The Indians tacked on two more runs in the bottom of the fourth. With two away, Sewell singled and scored when Ferrell homered into the center-field bleachers, the second home run of his career. Ferrell mowed down the Browns in the middle innings. Levey walked again in the sixth (with two outs), but the rest of the lineup could not solve Ferrell. Averill connected for his third homer of the year in the bottom of the seventh inning to extend the Tribe’s lead to 6-0. The Browns had their best chance at a base hit in the top of the eighth. In fact, it came down to the decision of the official scorer. Rick Ferrell stepped into the plate and smacked the ball to the left side of the infield. The ball eluded Burnett at third, but Hunnefield gloved it deep in the hole at shortstop, turned, and whipped the ball to Fonseca at first. The ball arrived in time, but it pulled Fonseca off the bag. The official scorer, Ed Bang of the Cleveland News, gave an error to Hunnefield. “I would have scored an error on the ball in any case,” said Bang. “From the press box I could see that Hunnefield’s throw was wild. Without a thought of Ferrell’s no-hit performance up to that time, I yelled, ‘Error for Hunnefield’ to the other newspapermen in the press box. The Browns were not finished. The Indians’ Hunnefield made it a hat trick with his third error on a ball off the bat of Frank Waddey, who was batting for Gray. With runners on first and second, Levey stepped to the plate. But Ferrell bore down and struck out the Browns shortstop. Rollie Stiles relieved Gray, and the Indians reached him for three runs in the bottom of the eighth. All three runs came across the plate with two outs. Ferrell doubled home two of the tallies for the big blow. With the Indians leading 9-0, the suspense turned quickly to the top of the ninth. With one out, Goslin walked. But Ferrell retired Kress and Schulte to finish off the Browns and become the youngest major leaguer to throw a no-hitter. He was the first Cleveland pitcher to throw a no-hitter since Ray Caldwell did it against the Yankees on September 10, 1919. Ferrell raised his record to 4-1, striking out eight and walking three. His gem was the fifth no-hitter in Cleveland baseball history. Ferrell finished the year with a 22-12 record and a 3.75 ERA. He batted .319 and set a record for home runs in a season by a pitcher (9). He is the all-time leader in career home runs by a pitcher (37). He hit another one as a pinch-hitter. Considering the start Ferrell had in his young career, it was not hard to believe Evans would draw parallels between the two hurlers. The author accessed Baseball-Reference for box scores/play-by-play information baseball-reference.com/boxes/CLE/CLE193104290.shtml and other data, as well as Retrosheet retrosheet.org/boxesetc/1931/B04290CLE1931.htm. 1 Weather Report, Cleveland Plain Dealer, April 29, 1931: 9. 2 Stuart Bell, “Wes’ No-Hit Title Clear,” Cleveland Press, April 30, 1931: 21. 3 Stuart Bell, “Immortal Addie’s Famed Fastball No Better Than What Ferrell Threw Yesterday — Evans,” Cleveland Press, April 30, 1931: 21.